This is not much of a "Jeeping" trip, but is a nice way to spend a half day doing something different. How many people know there is a coal mine and a coal-fired generating plant in the area? 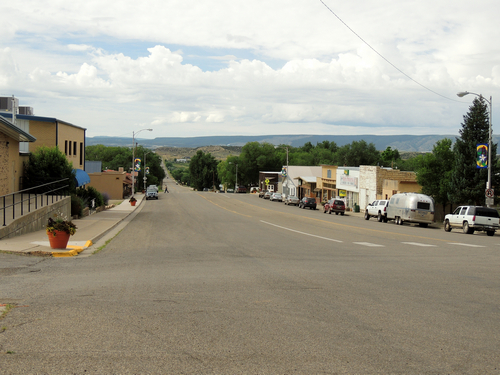 How many people know there is a town named Nucla that started as a commune? There is a restaurant in town, so you could plan to be there for lunch. We did not try it, so do not know if it is any good. 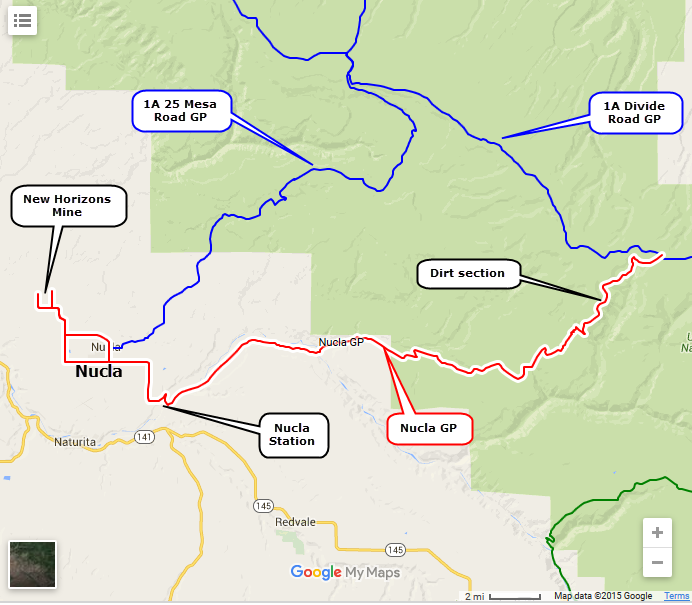 We show this trip starting on the Divide Road and ending in Nucla. 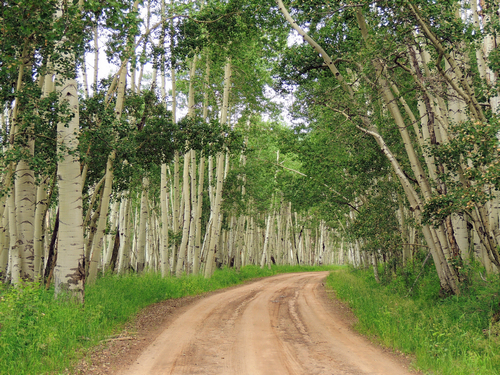 Most of the route is graded gravel road or pavement, but the first dozen miles after leaving the Divide Road are dirt. A bit rutted in 2016 but still easy. 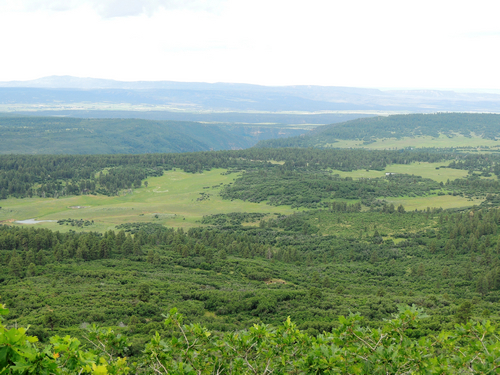 The first section is in the National Forest with many stands of aspen as well as views of the lower country. 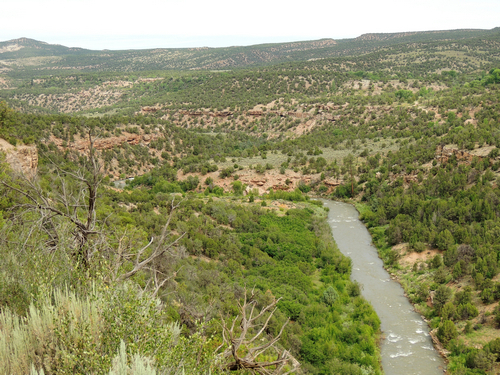 Continue past dispersed ranches and then cross the San Miguel River. 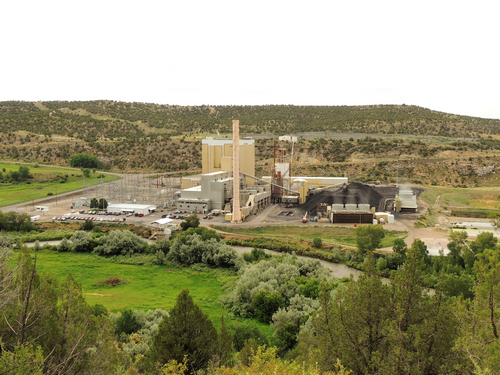 There is much farmland around Nucla, and also a coal-fired power plant called the Nucla Station. Coal that fuels the plant comes from the New Horizon Mine on the other side of Nucla. New Horizon Mine was developed in 1993 as a fuel resource to Tri-State’s recently acquired Nucla Station. 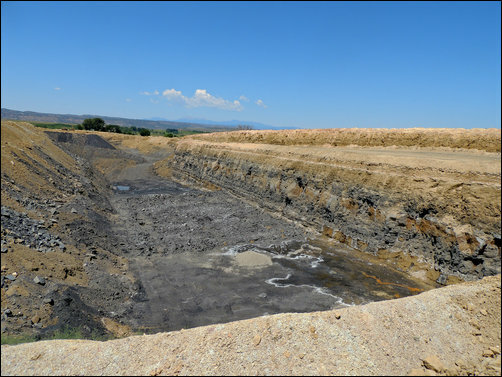 The mining operation is located about five miles from the power plant, outside the town of Nucla, Colo. The permitted mine site encompasses approximately 1,100 acres and employs approximately two dozen employees. Mine personnel use the truck and shovel method to remove overburden and expose and extract the coal from beneath the surface. The mine’s equipment fleet includes four bulldozers, an industrial-scale shovel and three 100-ton trucks. 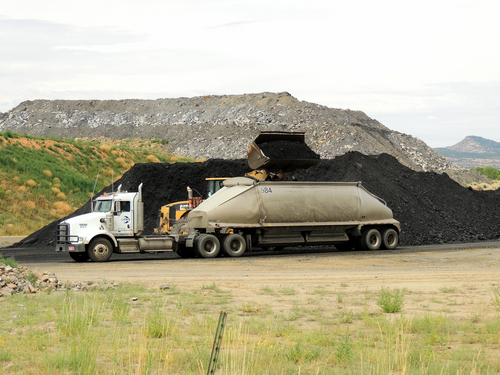 New Horizon Mine supplies several thousand tons of low-sulfur, crushed coal to Nucla Station each month, transported by over-the-road 25-ton haul trucks. Follow the track for this trip to see highway trucks being loaded with coal, and perhaps a glimpse of the coal seam over the berms that obscure any good view of the actual pit. 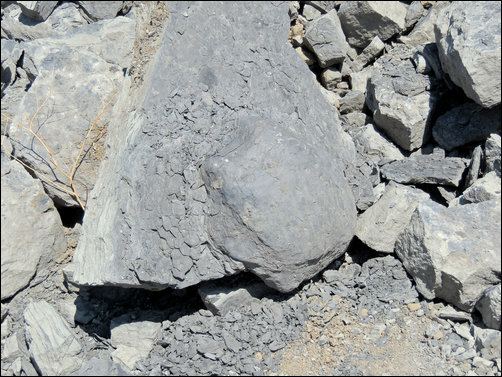 The coal is a shallow seam that is reclaimed immediately after mining. This is what we did on our first trip in 2015. We visited again in 2016 and were very lucky. There was no active mining at the time and we were given a tour of the reclaimed countryside, as well as down into the pit. The manager is happy to educate people on mining activities as a way to build understanding about coal mining. You may be able to get a tour by visiting their office at 27646 W 5th Avenue, just west of Lincoln St in Nucla. A phone number from the web is 970-864-2165. The coal is 60-90 under the surface. There is a single one-foot thick seam then a six-foot layer of several individual seams. 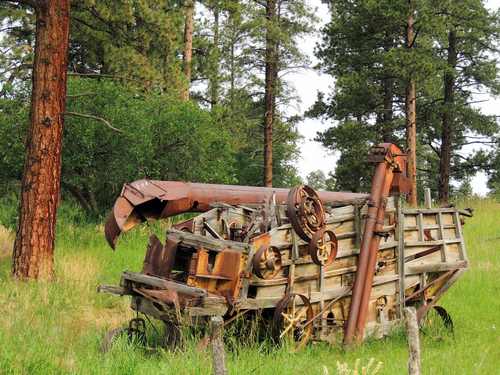 A large area of leased land has been mined over the years. 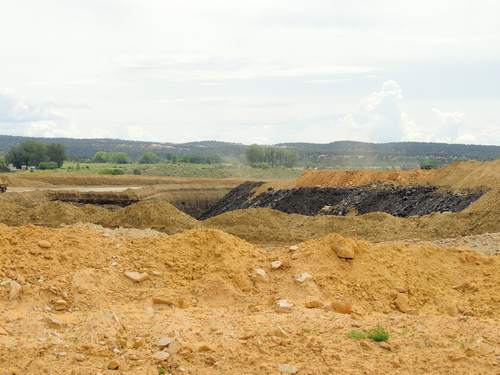 Overburden is removed and stockpiled by soil type and depth. After mining the hole is refilled with soil in the original depth pattern and is contoured according to landowner wishes and Government regulations. The land is revegetated, often as cropland, and is irrigated and nurtured at the Mine's expense for 10 years before being returned to the landowner. 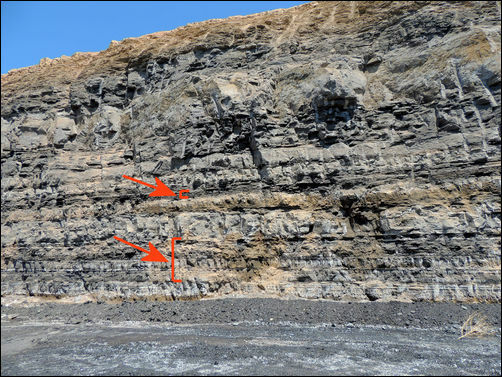 This photo shows the "plaster cast" of a dinosaur print in one of the non-coal layers. This is what you would have if you poured plaster in an actual print. We were told that they seldom see the actual prints.